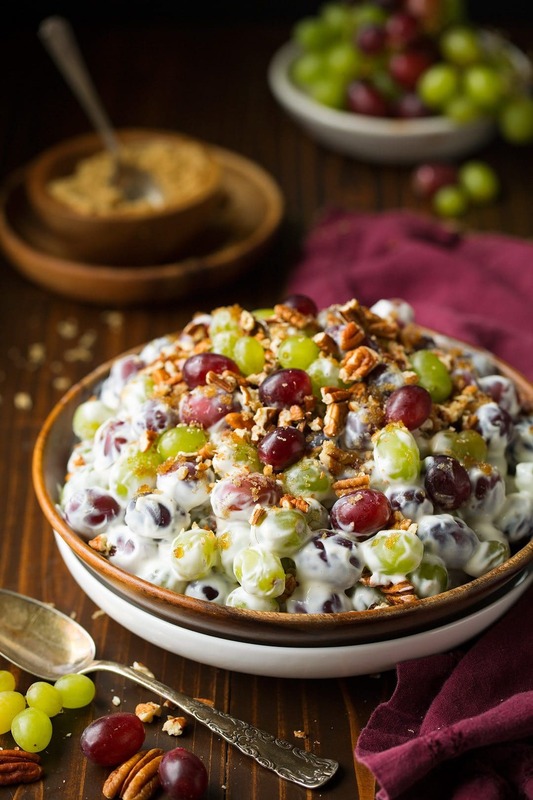 Grape Salad tossed with a sweet and creamy light cream cheese dressing, and paired with crunchy pecans for contrast! This is one of those simple satisfying sides that people love at cookouts. It uses basic ingredients yet produces incredibly delicious results! 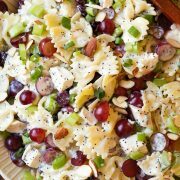 The Best Grape Salad Recipe! While I do enjoy winter, I’m totally happy to be moving along into spring and summer. I love all the spring blossoms everywhere (the smell of the lilacs is making me want to live outside lately) and I just can’t get enough of those warm sunny rays. Lately, grapes have finally been a decent price so I bought a bunch of them and used them to make this fruit salad that I absolutely love. 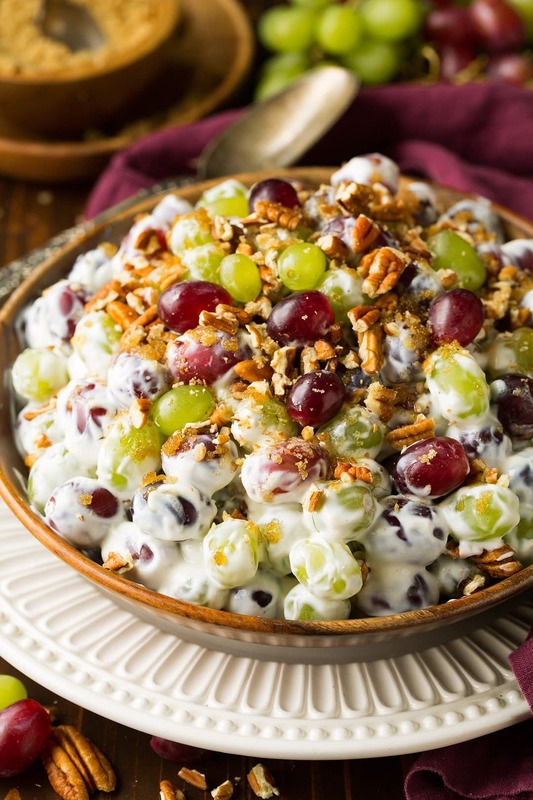 I first had a version of this Creamy Grape Fruit Salad many years ago at a party and fell in love at first bite. I mean how could I not? Anything with cream cheese or Neufchatel cheese and I’m sold! As usual I used my favorite brand of nuts here – I used Fisher Pecans for this recipe. 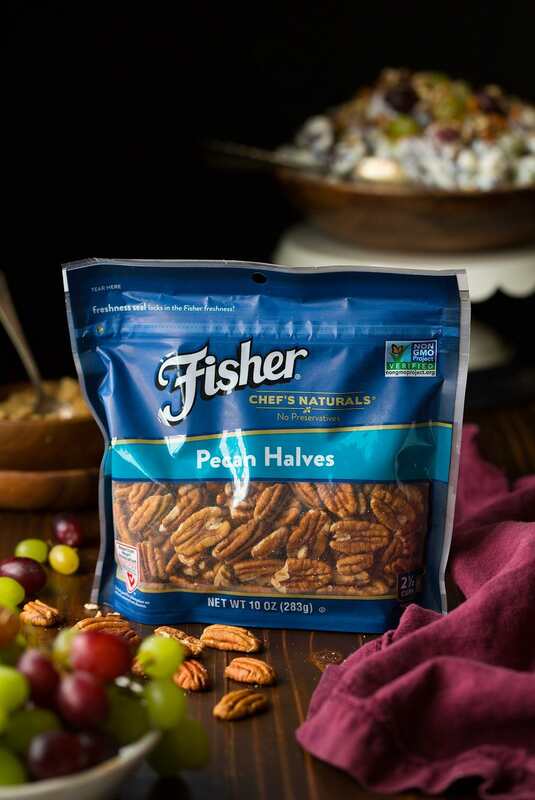 Fisher is a brand I’ve long trusted and I love knowing they are preservative free! They are one of my go-to snacks and recipe ingredients and this salad just wouldn’t be the same without them. Whip Neufchatel cheese in a bowl with an electric mixer until smooth and fluffy. Add in sour cream, honey, granulated sugar and vanilla and mix well. Add grapes, cream cheese mixture and 3/4 of the pecans to a bowl and toss. Sprinkle over brown sugar and remaining pecans. Keep chilled, serve within a couple of hours. 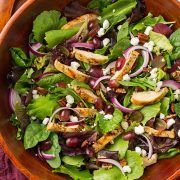 The classic version of this salad calls for cream cheese and sour cream but to make it a little lighter I like to use Neufchatel cheese and light sour cream. 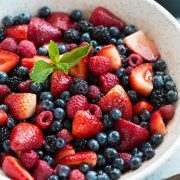 I also like to decrease the amount of sugar added (some similar recipes call for 4 times the sugar) but I like the sweetness to come from the fruit, no need to have them swimming in sugar for a fruit salad. Let’s save that for cake :). I also swapped out some of the sugar for honey. And usually it’s listed to use equal parts red and green grapes but I definitely like red better so I use 2/3 to 1/3 (and be sure not to use sour green grapes – I hate when I get a batch of those). And of course I like to add a fair amount of nuts because I love the crunch and flavor they add to this fruit salad. Make it for yourself and you’ll see what I mean! All those sweet juicy grapes, along with some crunchy pecans for contrast, all paired with luscious dressing to finish it off. And when served nice and cold it’s amazingly refreshing on a hot summer day. Add it to your menu this weekend, and definitely save the recipe for upcoming get togethers and holidays! Such a refreshing fruit salad! 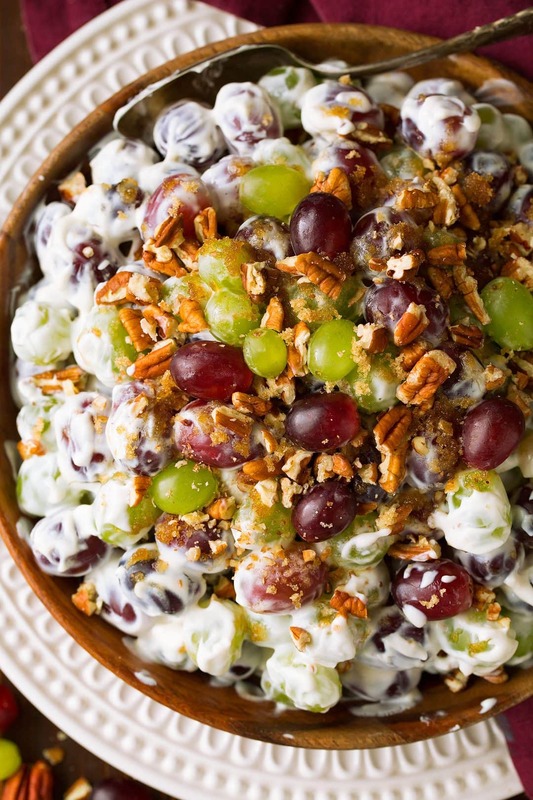 Sweet, crisp grapes are tossed with a rich cream cheese dressing, and paired with crunchy pecans for contrast! This is one of those simple satisfying sides that people love at cookouts. It uses basic ingredients yet produces incredibly delicious results! In a medium mixing bowl using an electric hand mixer whip Neufchatel cheese until smooth and fluffy, while occasionally scraping down sides of bowl. Add in sour cream, honey, granulated sugar and vanilla and mix until well combined. 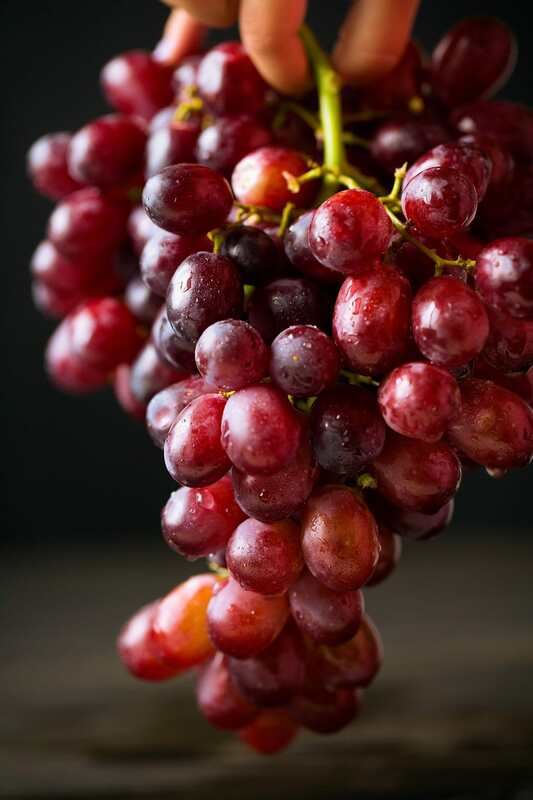 Place red and green grapes in a salad bowl. Pour in sour cream mixture and about 3/4 of the pecans. Toss to evenly coat. Sprinkle top of fruit salad with brown sugar then sprinkle with remaining pecans. Keep chilled, serve within a couple of hours. Paige: This is totally a salad that my husband would be obsessed with! Totally need to give it a try soon!